Not only do you have to feed your family, now you have to heat your home. Even last century, cutting peat was a way to warm your home and expand the available area for farming. Forests filled a similar niche. 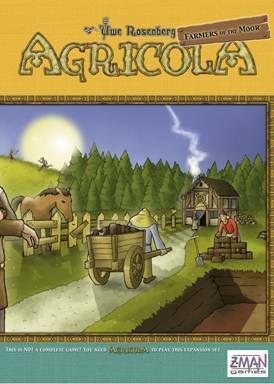 With â€œAgricola â€“ Farmers of the Moor,â€� players start the game with Moor and Forest tiles on their farmyard. They must use Special actions to remove them to give greater space for their fields and pastures. Removing the tiles provides Wood and other Fuel, which they need to heat their home. The Special actions give the game a different dynamic. These are additional actions, which players can take without placing one of their People. Includes: wooden horses, 150 cards, forest/moor tiles, fuel tokens, new scoring pad, etc. I'm not sure more is always better. I didn't find anything necessarily wrong with this, but there was already enough in Agricola for me. Nor did I play it enough that I feeling like I was wearing it out and it needed juicing up. Friends who have played more Agricola than I have seem to enjoy this tremendously. If you have played agricola enough to warrant buying this then it is a great buy. Basically it adds a ton more cards and a few tweeks to the game to add to the depth. If you've played Agricola 20+ times and are still enjoying it greatly, this expansion is probably right for you. It adds more options, more requirements to fulfill, and more cards to spice up the variety of the base game. I highly recommend it! I've played Agricola quite a bit and it seems to greatly boil down to whoever can grow their family the quickest has a huge advantage..... this strategy seems to dominate our games. This expansion helps to balance out this observed imbalance by requiring you to heat your home....the bigger the home, the more fuel is required. Now, small-family strategies are much more reasonable and make the game much less repetitive. If you've played the base game and have seen any of what I've observed, please give this expansion some consideration. A great expansion to one of my favorite games. Adds a lot of good depth, new strategies to winning, as well as a more balanced game that puts less emphasis on being first in turn order, and the need to always grab wood when available. Adds a whole new level of strategy to an already great game. Highly recommended.